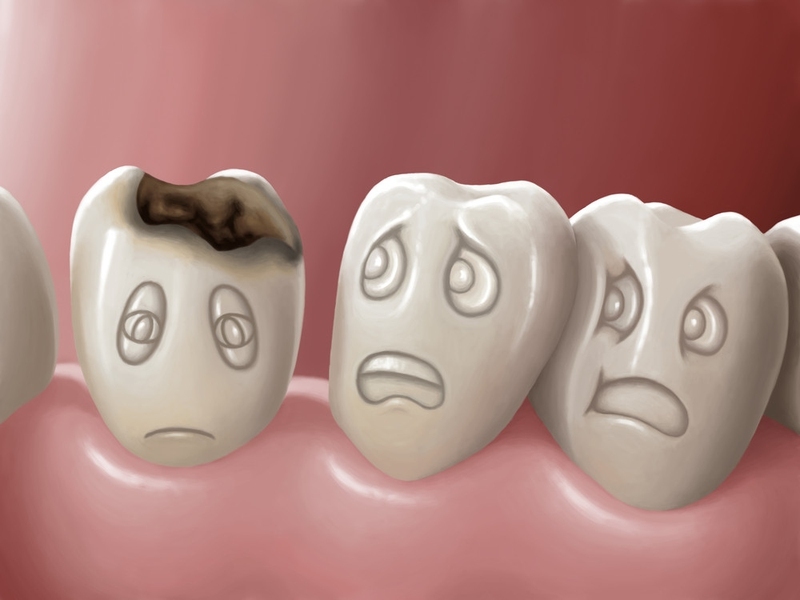 Tooth decay can make holes in your teeth, which are called dental cavities or caries. A bacterial infection is usually the main reason behind decay, but foods that attach to your teeth or poor oral hygiene may also contribute to the development of cavities. Other common causes of dental cavities are frequent snacking, dry mouth, and not providing your teeth with enough fluoride. If you're experiencing issues like tooth sensitivity, toothache, visible pores, or mild to sharp pain in a tooth, it could be due to tooth decay and dental cavities. When left untreated, cavities can lead to severe pain and even tooth loss. You have to take good care of your teeth and try some home remedies for cavities to correct the issue and save your tooth from further damage. You may have to talk to your dentist in severe cases, but before that you should take self-care measures and use certain home remedies for cavities to protect your tooth. You can opt for this age-old home remedy for cavities and bleeding gums. Oil pulling involves swishing essential oil in your mouth to get rid of harmful bacteria that causes tooth decay. Put a tablespoon of coconut, sunflower, or sesame oil in your mouth and swish it for about half an hour. Don't gargle or swallow the oil. Instead, spit it out, then rinse your mouth. Do this on an empty stomach every morning. Saline water will always offer several dental benefits; in fact, it works quite like a high quality mouthwash. It has antiseptic and anti-inflammatory properties, so it can ease pain, reduce inflammation, and clear any infection. It can also be an effective home remedy for tooth decay. Take a glass of lukewarm water and dissolve a teaspoon of salt in it. Take a sip and swish it around in your mouth, especially on the infected tooth. Repeat it thrice a day. Due to its antibiotic and antibacterial properties, garlic can help alleviate pain caused by bacteria and other infections. So it is often recommended for tooth decay and cavities. Crush at least three garlic cloves and make a mixture by adding 1/4 teaspoon of rock salt. Apply this paste directly on your infected tooth and leave it there for about 10 minutes or so. Rinse it with water or mouthwash. Repeat it twice a day to reduce cavities. There is some research to back the idea that licorice root is beneficial for teeth. It contains two effective antibacterial compounds – licorisoflavan A and licoricidin – both of which help prevent cavity-causing bacteria. The next time you brush your teeth, use dried licorice root powder for it. You may also consider using a licorice stick for brushing, but be sure to select a soft one to avoid hurting your gums. Turmeric is among the most popular home remedies for cavities due to its anti-inflammatory and anti-bacterial properties. It prevents tooth decay and keeps your gums healthy. Simply apply turmeric powder directly on the cavities and leave for a few minutes. Rinse it with warm water for pain relief. Repeat it once or twice daily for at least a few days. It has natural antibacterial properties, so it proves beneficial in fighting cavity-producing bacteria. It also promotes overall dental health because it contains vitamin E and A with calcium, iron, and magnesium. You can fight cavities simply by drinking 1/2 glass of wheatgrass juice daily. Be sure to drink it on an empty stomach for better effects. You have to limit sugar intake to prevent cavities and protect your teeth from decay. Oral bacteria thrive on sugar, and if you cut back on sugar, the bacteria will die starving. Start by saying no to candy, soda, and baked goods. Instead, add maple syrup and raw honey to your diet. Don't use artificial sweeteners because they will cause tooth decay and lead to other health issues as well. Your cavities can be caused by poor nutrition. One of the simple home remedies for cavities is to add more fat-soluble vitamin as well as mineral to your diet. It means adding more vitamin D, E and A in your diet with minerals such as magnesium, calcium, and phosphorus, which are all good for tooth. Add cooked and raw vegetables in your diet, especially green leafy veggies. Add meat, bone broth, fish, and eggs to your diet. Eat raw dairy such as cheese, kefir, and grass-fed butter. Add at least one piece of fruit to your daily routine and have it early in the day. Get more vitamin D from the sun and from the supplements. Eat more healthy fat like found in avocado, coconut oil, fermented cod liver oil, and olives. The abundance of phytic acid in your body may also cause dental cavities and lead to tooth decay as well. Phytic acid is an enzyme inhibitor and mineral blocker. It is found in nuts, grains, beans, and seeds. Food rich in phytic acid are un-absorbable. It also binds minerals essential for better oral health, such as magnesium, calcium, zinc, and iron. It may also cause other issues, such as lack of appetite, digestive disorders, tooth decay, and nutrient deficiencies. You should limit your grain intake and say no to unfermented soy products. It is a good idea to sprout nuts and grains if you want to eat them because this reduces phytic acid by 50% or more. You should take steps to re-mineralize your teeth to prevent any decay from happening again. A fluoride mouthwash or toothpaste will help in this regard. You can also make a re-mineralizing toothpaste by mixing 5 parts calcium powder, 2 parts baking soda, 3 parts coconut oil, and 1 part of diatomaceous earth together. Then brush your teeth with it. Don't forget to rinse and gargle after every snack and use antibacterial mouthwash for better results. Drink black and green tea to reduce the growth of bacteria in your mouth. Chew sugar-free gum to ensure you produce more saliva that prevents dry mouth. Floss your teeth at least once a day and brush at least twice a day. Visit your dentist regularly to find cavities early.